The resume is an essential component of your business school application, and one that travels with you on your MBA interview. The MBA resume differs from one that is created for job hunting in a specific functional area. Learn how to maximize the impact of this all important document through practical advice on formatting, content and more. 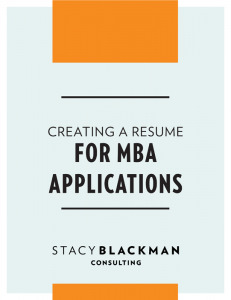 The Stacy Blackman Consulting resume guide includes 6 sample resumes from candidates of differing backgrounds, a list of action verbs and specific examples for how transform content from mundane to "winning". Format: 31 page PDF download.